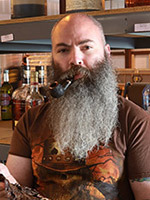 A pipe smoker for over a decade, Jeremy is as passionate about pipes, pipe tobacco, and blending tobacco as a man can be. His experience as a tobacco shop manager, as well as a wood-fire pizza chef, give him unique insight into running a boutique blending operation like Cornell & Diehl. When he isn't running the factory he enjoys the outdoors, particularly camping and hiking. He's an "adventurous eater," and has an expressed love for trying new things and attempting to recreate them in his kitchen at home, which is another reason he's such a great fit at C&D. Born in Portales, New Mexico, Jeremy is a bit of a rolling stone. He has called Chicago, Denver, Cleveland, and Portland home, before moving to South Carolina, where we hope he will stay.